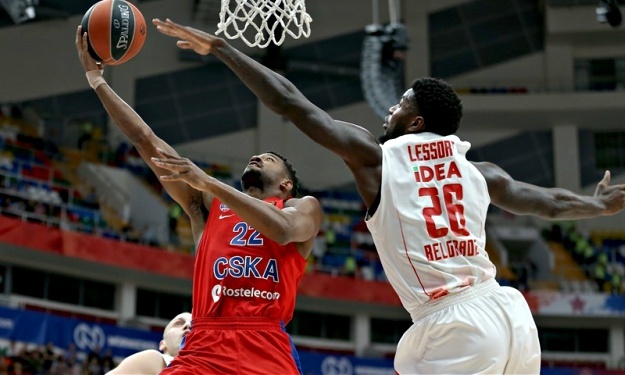 CSKA Moscow used a great second half to outscore Zvezda in the final game of the regular season. Crvena Zvezda put up a lot of fight in its last EuroLeague game of the season, yet CSKA outstood the pressure and prevailed 92-81 in Moscow. Despite a numb start by the Army team (just 14 points in the second period), an outburst in the third quarter helped them bounce back to the game and regain the momentum. Paced by Cory Higgins and Vitaly Fridzon, the hosts made use of the second half to prove once again why they’re leading the EuroLeague course so far. Higgins finished with 18 points, five assists and one rebound, while Fridzon shared 20 points, three rebounds and two assists. Sergio Rodriguez and Othello Hunter shared 12 points each as well, adding up to a great home victory for Dimitris Itoudis’ squad. The Russian side used its defensive tools, forcing Zvezda to 18 turnovers throughout the game, while the team was rather reserved from the three-point line, with 8 out of 14 attempts, a relatively low number for one of the best offensive team of the competition. CSKA finishes the first part of the season being the leader of the standings, with a 24-6 record, while the Serbian team goes out with 11-19.